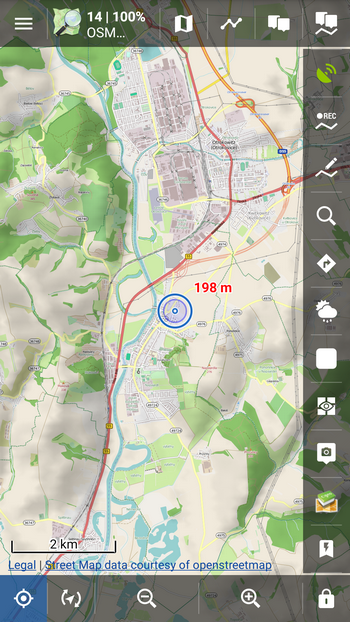 Locus Map offers a wide range of settings for navigation or guidance in terrain or along roads. Ordinary navigation, for example in a car or on a bike, is absolutely without problems, just listen to navigation commands and check the display ocassionally. However, if you need only the voice commands for the navigation it’s necessary to make some adjustments. These are useful for activities when your hands are occupated or you don’t have the phone just in front of your eyes – nordic skiing, nordic walking, running… That’s why I tried to find the most convenient solution how to set it up. First thing, you have to check your TTS (text-to-speech) settings (Menu > Settings > Language and Units > TTS settings). There’s no problem with major languages like English, German or French. Some minor languages must seek help from extra apps like e.g. Vocalizer TTS. Second thing that you’ll need is routing service for calculating routes. If you don’t want to be online all the time, try GraphHopper or even better BRouter. Personally I prefer BRouter. Not only it works with better updated data but also it offers more route calculating profiles. It often offers “wet” and “dry” variant that might come very handy when running or hiking. Thirdly, you have to make clear what you expect from the journey and decide according to it if to choose navigation or guidance along a route. Voice commands at direction changes work in both cases but guidance doesn’t recalculate the route. Instead, Locus notifies of the distance and direction of the nearest routepoint. That might seem to be a disadvantage but in free terrain it can be actually pretty useful. “Outdoors” we may easily get to places where the navigation doesn’t know any roads and then it won’t recalculate the route. 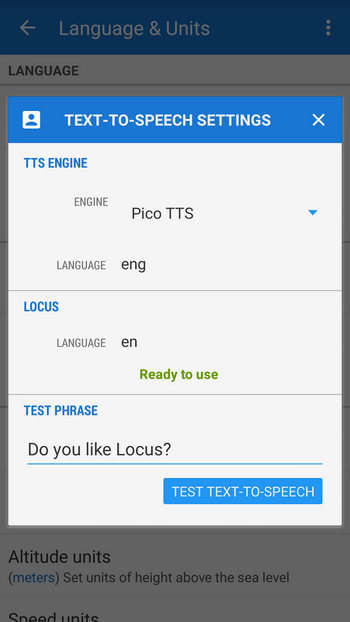 Locus, however, offers option to enable automatic switch from navigation to guidance. If you travel through a city to a particular target use turn-by-turn navigation with route recalculation. Tap Navigate to, define your target, check Compute instructions. In this case Locus automatically recalculates your route if you leave your original one. I recommend switching all automatic display switch-ons off so that the phone screen won’t turn on uselessly in your pocket. Then check Disable screen lock checkbox. You might need to check the screen and you don’t have to put your gloves off to unlock your phone, just switch it on with the HW button. All the same, I recommend to tap Hold map center button in lower left corner. 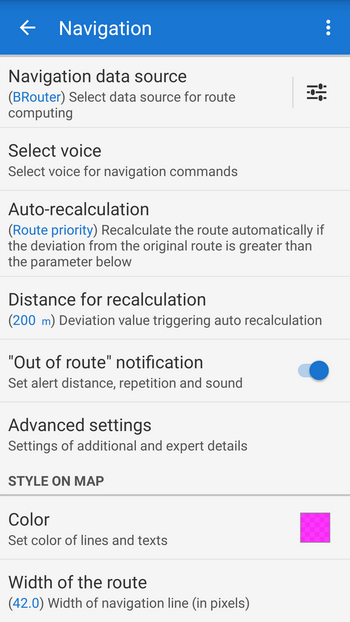 Auto-recalculation: route priority or point priority depending on what you think matters – the route you’re walking along or the target you want to get to. Out of route notification: ON. After unfolding the menu set the distance to 100 m and TTS for the sound. Advanced settings: Strict route following OFF. Maximum allowed deviation: 2 km (if you want navigation to switch automatically into guidance, set some lower value depending on the terrain character). Snap to route OFF. Number of commands Medium and Two commands at once ON. Notification ON, notification type TTS. Set notification of the next direction change: ON and TTS. Out of route notification: ON. 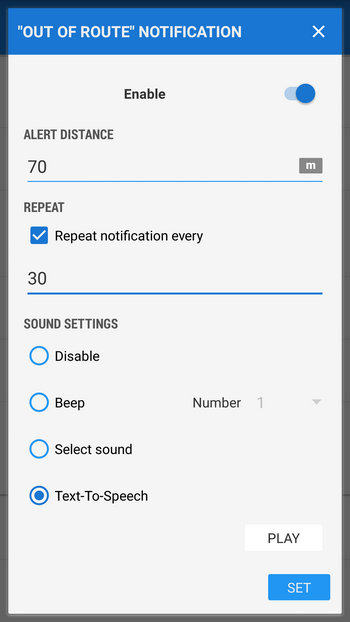 Alert distance 70 m and Repeat notification every 30 seconds. Sound settings again Text-to-speech. Advanced settings: I recommend to switch Strict route following OFF and switch Notify on every trackpoint ON. Here I recommend to switch on two notifications: Position acquired and Position lost. Set different sound to each of them to recognize easily the GPS status. Then, uncheck Track recording which is useful when you use Locus for recording your tracks and make a break for a snack in a pub. Just pause the recording and GPS goes off automatically. 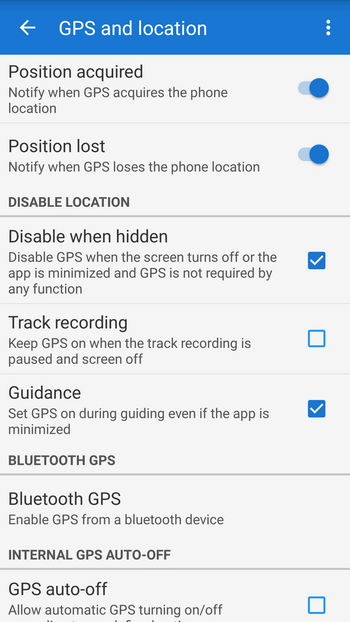 If you leave the feature on Locus will beep when you lose your GPS signal. I’m sure all these settings aren’t ideal for all activities. 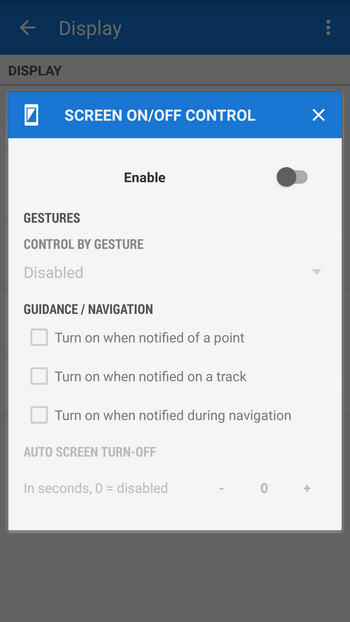 Also, the app can’t create navigation settings profiles yet which can be worked around by making several settings backups and naming them “bike”, “hike” etc. After launching Locus just restore one of the backups and Locus is set up as you need. It’s not perfect solution but it works. And I believe one time Locus will provide navigation settings profiles. And that’s sort of all I wanted to tell you about the voice-only navigation in Locus. Thank you all who made it all through the article and wish you a lot of nice kilometers hiked with Locus in your earphones. Chtěl bych se zeptat k tomu … “V Pokročilých nastaveních doporučuji …………………… a zapnout Upozorňovat na každý trackpoint” … Co znamená, resp. děla upozornění na každý trackpoint? Trasy v Locusu se skládají z řetězce bodů, kterým se říká trackpointy. Vámi zmiňovaná funkce vás upozorňuje v určité vzdálenosti na každý takový bod na trase. Není nutné mít tuto funkci zapnutou, může v určitých situacích obtěžovat, zejména na členitějších trasách, kde je trackpointů více. ano, vcelku je to tak. TTS služba nastupuje tam, kde klasické navigační příkazy končí. Kromě hlasových upozornění při sejití z trasy nebo navádění ji využívá také správce tréninků, který vám v zadaných intervalech hlásí vzdálenost, rychlost apod. Bez Vocalizeru funguje na Androidech TTS zdarma pouze v základních jazycích, my Češi jsme “odsouzeni” k nákupu. A pozor, není Eliška jako Eliška. Ta “navigační”, kterou si můžete zdarma stáhnout v Locus Obchodě není totožná s placenou Eliškou z Vocalizeru, jde pouze o shodu “jmen”. Á, no vidíte. Takže Elišku nahradili dvěma jinými, o to je to nyní aspoň jednodušší. Preferujeme Zuzanu, je plynulejší a zřetelnější. a máte slovenštinu do Vocalizeru zakoupenou?